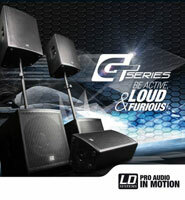 LD Systems packed a mighty punch at the recent BPM. Not only did they have the most diverse range of sound systems, it was also the launch pad for the brand new GT Series aimed specifically at the mobile market. LD Systems are fast becoming recognised for their superior sound, German high spec engineering and wooden constructed cabs. In this newsletter we will be reviewing the new GTs and looking at the very popular in line Maui System and the compact Dave Series. First impressions of the newly launched active GTs was that they ticked all the boxes for a mobile DJ or band who demanded high quality sound and portability at a reasonable cost. The powered tops are available as 10", 12" and 15". The corresponding subs are available in two sizes; 15" and 18". The top has a dual mount hole which means it can sit level, or sit at an angle which is handy if you are positioned on a high stage. The cab is shaped to lay on the floor as a monitor too. The wooden cab, yes, wooden, is coated with a textured dura-vinyl making it both robust but able to deliver an unmistakable warm sound that you would expect from a wooden cab. The stylish grill and overall design is unique and reflects the attention to detail that we have come to expect from German designers. For the purpose of my review, I road tested the 12" top and 15" sub. The top has 250W RMS. On its own it had incredible depth, delivering a warm punchy bass but maintaining a crystal clear top end. In the back is an integrated two band equaliser to enable further clarity of sound. Versatile and stylish, these amazing speakers are only around £320 each. The sound quality is far superior to its humble price tag. With a choice of three sizes, I've chosen the middle one to concentrate on; the Maui 28mix. It is a vertical array system which is both versatile and quick to assemble as there are no stands or poles. One unit comprises everything you need to play a full range. The base incorporates 2 8" subs and a class A/B amplifier with built in mixing capabilities including Mic input and controls. The tower boasts 16 3" horns and a 1" tweeter. The sound is the high quality you would expect from LD and the 120degrees dispersion of sound is worth noting as it creates an even sound round the room and is resistant to feedback. For mobile DJs, this is a perfect solution. It deals equally with the spoken word as it does with either live or recorded music. It shines at all volumes, from 'fill the room make the windows rattle' to sophisticated background dinner or ceremony music. Being both discreet in design and quick to assemble, it is the perfect choice for wedding DJs who may have to set up in one room for the wedding ceremony and another for the rest of the day. I could go on all day about the superior build and exquisite sound of LD Systems, but it's far better for you to go and have a listen yourself. Attending will be American DJ, JBL/Soundcraft, Sennheiser, EMD, Numark/Denon, Reloop plus Paul & Sandy from AMPdj. All in all another exciting evening to look forward to. The next Glasgow meeting is scheduled for Tues 4th November 2014 at 8pm (doors open 7.30pm for networking). You can join the Facebook group and keep up-to-date. "I've got a few bookings from AMPDJ, so it's a big thanks from me. Another good thing is if I need advice or help you're just a phone call away."